If you live in the Nehalem Bay area, you’ve likely heard by now about a changing-of-the-guard at Manzanita’s Big Wave Café. In September, longtime owner Marcie Russo sold the local dining establishment to Brian and Carol Williams, who, though born and raised in Oregon, left notable careers in Chicago to take over operation. We had heard a rumor that the restaurant had sold when Brian called us from Chicago to ask for help publicizing the purchase. It was a pleasure to work with Brian, Carol, Marcie and Valerie Schumann, the local real estate broker who connected all the players in the first place, in crafting a press release announcement that later ran in the Tillamook Headlight Herald (Oct. 19, 2011 edition) and North Coast Citizen (Oct. 20, 2011 edition) – thanks, editors! Join us in welcoming the Williams to the Big Wave Café and in wishing Marcie continued success at her Great Northern Garlic Co. venture. 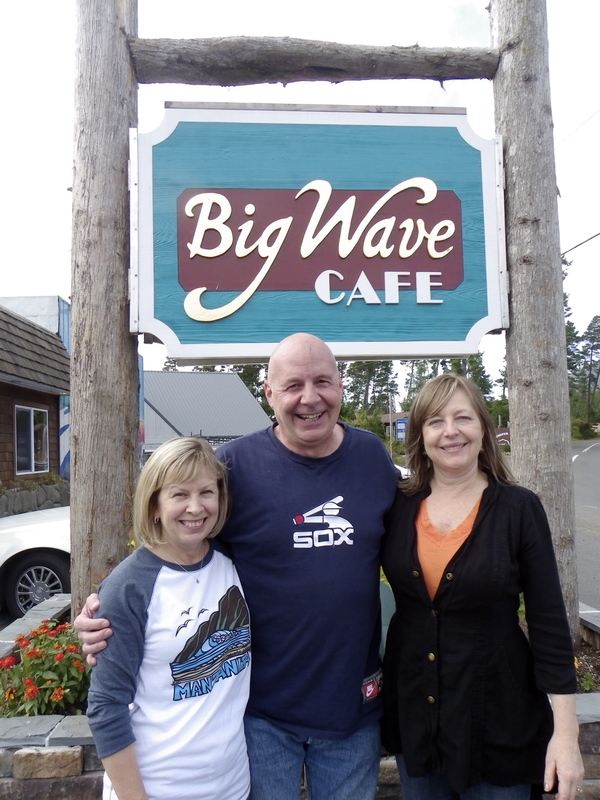 MANZANITA –Discovering the Big Wave Café was for sale put Brian and Carol Williams’ plan to eventually relocate from Chicago to their home state on the fast track. “I wasn’t looking into resigning my position or moving until I found out our favorite restaurant at the Coast was for sale,” said Brian, until recently senior vice president at Career Education Corporation for Le Cordon Bleu. The Williams, who assumed ownership of the popular surfer-themed restaurant on Sept. 30, had been longing to live closer to their hometown of Portland and spend more time with their grandchildren Kate and Jack. When Carol learned that café owner Marcella “Marcie” Russo had quietly placed the restaurant on the market with close friend and real estate broker Marylyn Facchini, she thought of all the times she had enjoyed meals there with her daughter and agreed with Brian that purchasing the Big Wave was an opportunity they couldn’t afford to miss. The Williams met with local broker Valerie Schumann with Prudential Northwest Properties Commercial to finalize the deal. “The Big Wave is in good hands, and this community is lucky,” said Russo, who had owned and operated the restaurant for years prior to selling it to the Williams. The couple has an impressive culinary resume, with Brian boasting 40 years of experience, most recently with Le Cordon Bleu. Although he was based in Chicago, he traveled extensively with the position. “I’ve had a lot of fun,” he said. “I’ve flown around the world.” With 16 schools in the United States, Le Cordon Bleu is one of the largest providers of culinary arts education worldwide. “Prior to that, I worked at the corporate offices for Red Lion in Vancouver, (Wash.),” said Brian. In that capacity, he opened restaurants across the country. Carol and Brian graduated from Western Culinary School in Portland, which was later purchased by Le Cordon Bleu. Carol, meanwhile, worked in the bakery department at Safeway for 20 years and studied with a renowned French pastry chef at Petite Provence, an upscale French bakery in Portland. “Between the two of us, we have an awful lot of experience,” said Brian. The Williams are both native Oregonians and have owned a second home in north Tillamook County for a number of years. “The Oregon coast has always been our special place to visit since high school,” said Brian. Russo, too, was motivated to sell the café to spend more time with family, including Frank, grandson Landon and daughters Brooke and Morgan. The time had come, she added, for her to let the Big Wave Café move on, as it were, as well. Two years ago, she opened the Great Northern Garlic Company in a converted fuel station across the parking lot from the restaurant. She again teamed up with her husband Frank to reinvent the building from the inside out. She plans to continue to own and operate that venture indefinitely. The Big Wave Café is located at U.S. Highway 101 and Laneda Avenue. For more information, call 503-368-WAVE (9283). Posted by rockyintertidalcocreative on November 3, 2011 in Uncategorized.